Cognitive Behavior Therapy (CBT) has more research demonstrating its effectiveness than any other form of therapy. Cognitive Behavior Therapy often succeeds where other therapies have failed. 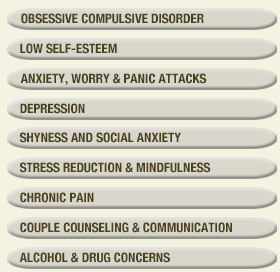 We utilize many forms of Cognitive Behavior Therapy including Exposure, Mindfulness, Acceptance, and Dialectical Behavior Therapy Techniques. Because Cognitive Behavior Therapy (CBT) is now recognized as the most effective treatment for most psychological disorders, many therapists with little knowledge of CBT now claim that they are Cognitive Behavior Therapists. But we can honestly claim expertise in CBT. For over 20 years, we have been practicing CBT, and teaching and writing articles about Cognitive Behavior Therapy for mental health professionals. We provide a lot of guidance on how you can change your behavior and how you can change the way you think about yourself, your experiences, your future, and the important people in your life. Making these changes will relieve anxiety, depression, and other distressing emotions. It will raise your self-esteem, improve your relationships, and increase your pleasure and success in life. "I had been to 9 other therapists, many of whom claimed to be CBT specialists. Unfortunately...I continued to suffer tremendously. Once I began to work with CBT-NJ, the difference was dramatic. My recovery from anxiety and panic has not only been steady and consistent but much faster than I ever imagined." "I am forever grateful for the support, insight and compassion my therapist at CBT-NJ showed for me. I never thought I would find a therapist that would understand my anxiety and have so much expertise. And now I'm 158 days anxiety attack free! " "I really liked several previous therapists I had seen, and they helped me to understand myself, but my severe OCD and depression didn't get any better until I saw a therapist at Cognitive Behavioral Psychologists of NJ." "I wanted to seek help for the constant, debilitating anxiety. 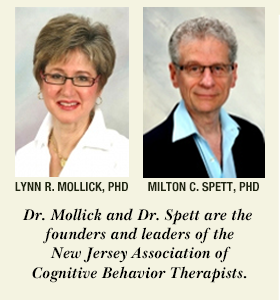 I am so grateful to have found a doctor at Cognitive Behavioral Psychologists of NJ. Each day I think it is the smartest thing I've ever done." "I contacted Cognitive Behavioral Psychologists of NJ and started seeing a terrific therapist who helped me change the way I react to life's many stresses. It has changed my life in the most positive way." "I don't think there are enough words to describe how grateful I am for all that you have done for me and taught me." Site designed and maintained by Fjordstone Inc. Website Design.